The hospitality industry is one of the fastest growing industries today with more and more people traveling for business as well as for pleasure. India today offers hotel facilities at par with the world standards and has the capacity to cater to ever growing investment demand in infrastructural development. It is also one of the largest employers in the country with a potential to provide jobs to the ever increasing population of the country. Lately the demand for hospitality related educational progammes has also increased. Despite all these trends we still find that many players in this sector are still far away from understanding the benefits of international standard and practices of this industry. The Indian hospitality industry has still unable to full incorporate the new management practices to the extent that it should have. Why is this so? 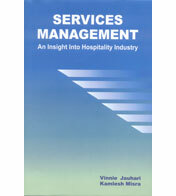 Services Management: Insight into Hospitality Industry is an attempt to document the current research on international practices in the industry which if adopted could bring long lasting rewards to the Indian industry. The book illustrates the dynamics in hospitality industry and focuses on various aspects such as strategy, marketing, human resource management, information technology and productivity. The research included in this book brings an international context to the hospitality industry thereby making it more universal in its approach. The book is divided into various chapters where each can be read as an independent piece of research work to facilitate those that want to focus on specific areas. Contributors to the book constitute a select group of academicians and those working in the field of Services Management. This book is a must for hospitality administrators, senior hospitality managers, consultants, researchers, educators and most of all students who wish to make a career in the service sector of the new economy. Please complete the book form for placing the order.